It’s a fact: people love to play games, but what do they love even more? When a game has a chance of ending with a prize. Why do you think so many people go to casinos? Bring some of that motivational fun into your country club using your already existing digital signage! By incorporating games and prizes (discounts, giveaways, etc.) into your digital signage or interactive systems, you are not only going to attract more people to participate but you’re showing them that you care about their engagement with the club. They’re not only there to play golf and be social with other members, they’re there because they chose your club instead of somewhere else. Giving them more reason to stay is important as it shows your dedication to your members. 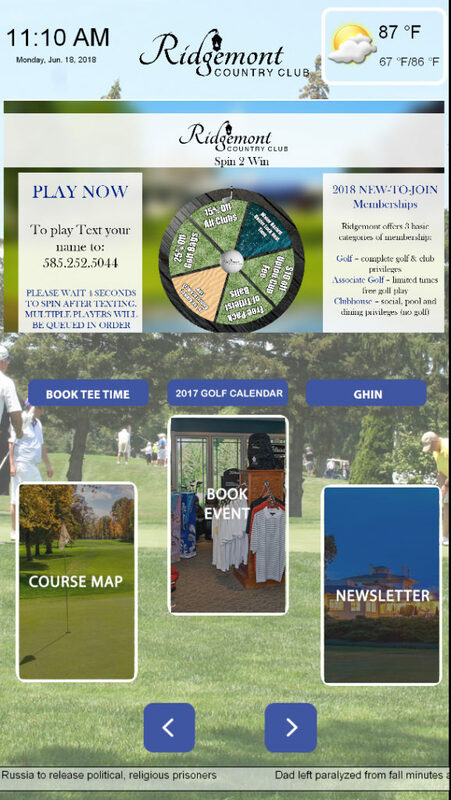 Not only is implementing something like this beneficial for member entertainment, this is beneficial for you as a country club because on the back end, you have the ability to capture the information you need, whether it’s their name, phone number, email, etc. to then further market to them in the future. This is a great way of capturing data in order to connect on another level with your members – for updates, promos, discounts, etc. – giving them reasons to come back and bring their family and friends! Looking for more information on country club digital signage? Click here! !